Milani's Color Statement Lipstick's are available in 30 shades of Naturals & Browns, Plums & Berries, Pinks & Corals, and Orange & Reds. 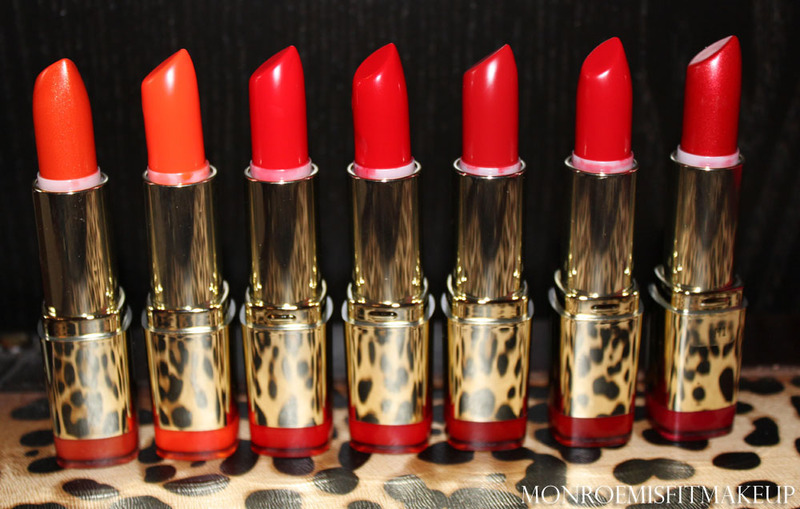 The light-weight creamy formula contains Vitamin A, C, & E to moisturize and nourish the lips. Available in Vinyl, Metallic, Cream, Shimmer, Pearl & Matte finish. With 8 new shades of lipliners to pair with them they make a true color statement on the lips. 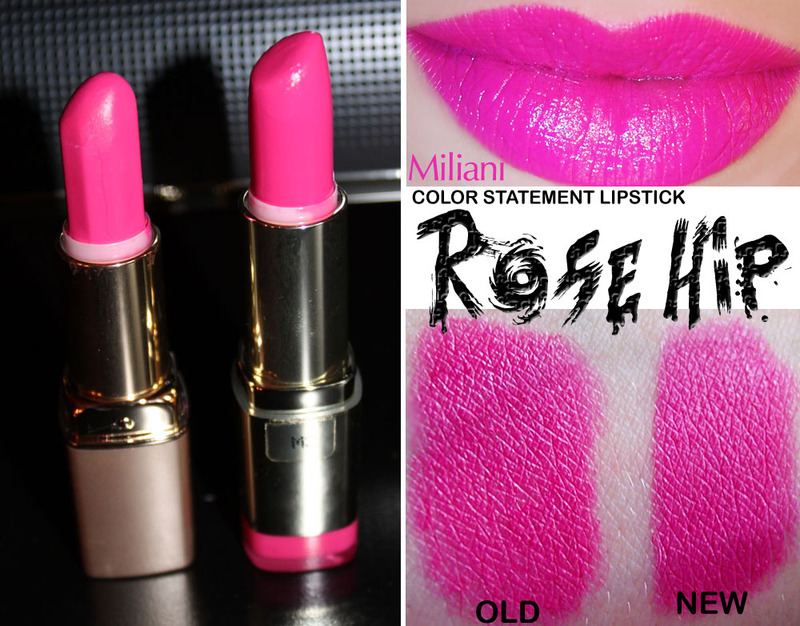 The formulation of Milani's Color Statement Lipstick's are exactly as they describe them...lightweight, full coverage, and creamy on the lips. 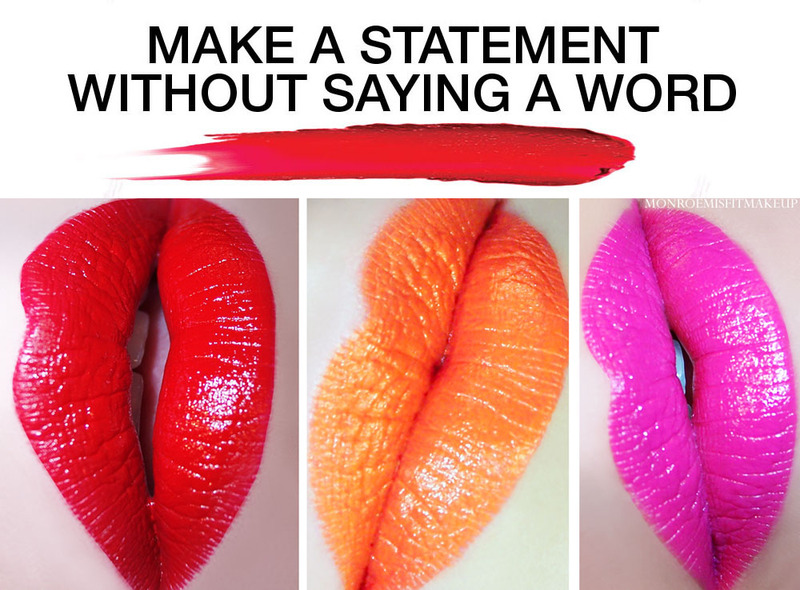 They give full saturated color in one stroke and wear evenly for a good 3-6 hours. 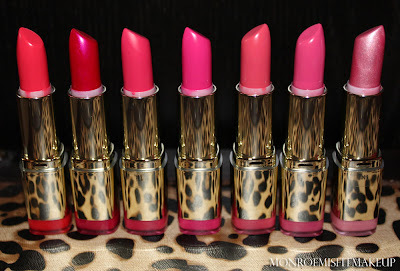 One main thing to note is that Milani's lipsticks have a strong fruity watermelon scent. I don't mind it, but just be aware that they'll taste a bit like candy at first. A lot of the colors appear similar to eachother especially the red's, where they differ though is in the finish. My preferred being the cream and vinyls. I'm really amazed at how lovely this new formulation is, they look and feel like high end lipstick's but at a fraction of the cost ($5.95). 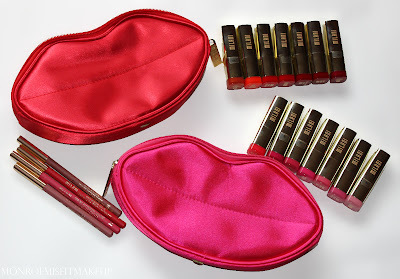 You will certainly be seeing some FOTD's with these. I loved nearly every one of the colors in the Orange & Red Category, you can never have too many Red's to choose from can you? 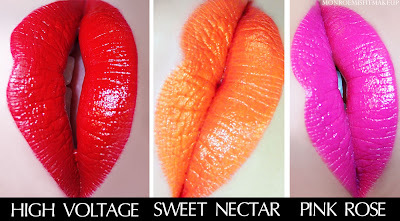 If I had to pick favorites it'd be Sweet Nectar, this intense orange shade is not one you see often in drugstore's. For the Red's my heart goes to the slick vinyl finish of High Voltage and the the blue based cream Red Label. The perfect mix of pink's and corals for Spring. If Red's are too out there I can guarantee you'll find a shade to love in this set. It has much more variety than the Red's and is a mix of warm and cool tones. While still bright in color they're not shockingly so. The only shade I didn't care for was Pink Frost. Light Pink frosty mettalic is majorly 80's and not in a good way. My fav's were Rose Hip, Hot Pink Page, Flamingo Rose, and Fruit Punch. I was delighted to see Rose Hip in the lineup! If any of you have followed me on youtube (year's back when it was still cool) I had a tutorial featuring this bright pink lip color and people really took to it. 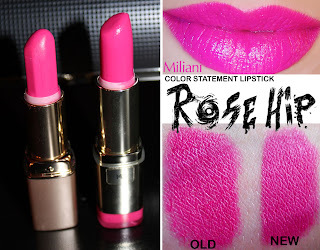 There weren't a lot of affordable hot pink lipstick's out there at the time so Milani was really blazing the trail with that one. I did a comparison of my old Rose Hip to the new and the color is nearly identical, with the new version maybe a touch cooler? It also has a far more pleasing scent/taste than the original. 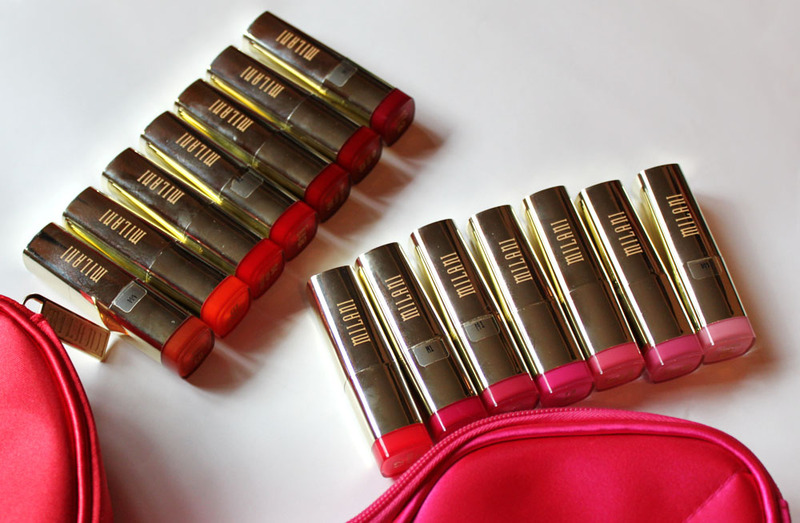 Color Statement Lip Liner: The lip pencils come in 8 shades. 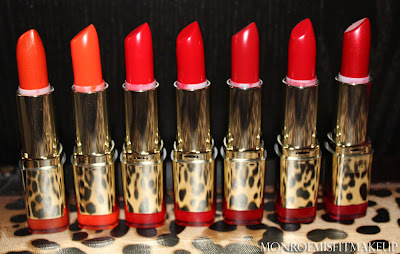 All of the pencil's are great shades that will work well with many different Lipstick's. True Red is the perfect pencil for a red lip, I've replaced my MAC Red with it. The formula is a lot more forgiving, gliding on easily with out pulling on the lips. 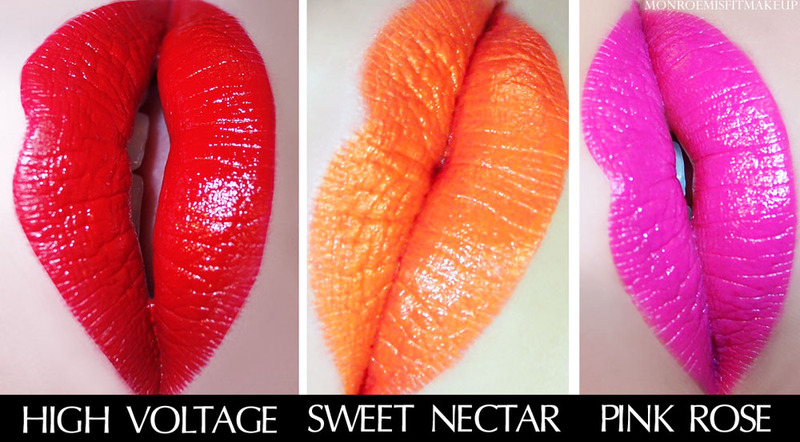 I wasn't able to swatch them all because my lips are a little chappy from being sick so I picked my Top 3. 1. High Voltage with True Red Lip Liner...this color is ridiculous!